Oh yes! YES! I’m on this ship! Song Yi (The Disguiser) and Zhu Yi Long (Xin Xiao Shi Yi Lang) are both signed up to headline a new novel adaptation of The Rhapsody Of A Summer Dream (夏梦狂诗曲 ) written by Jun Zi Yi Ze. 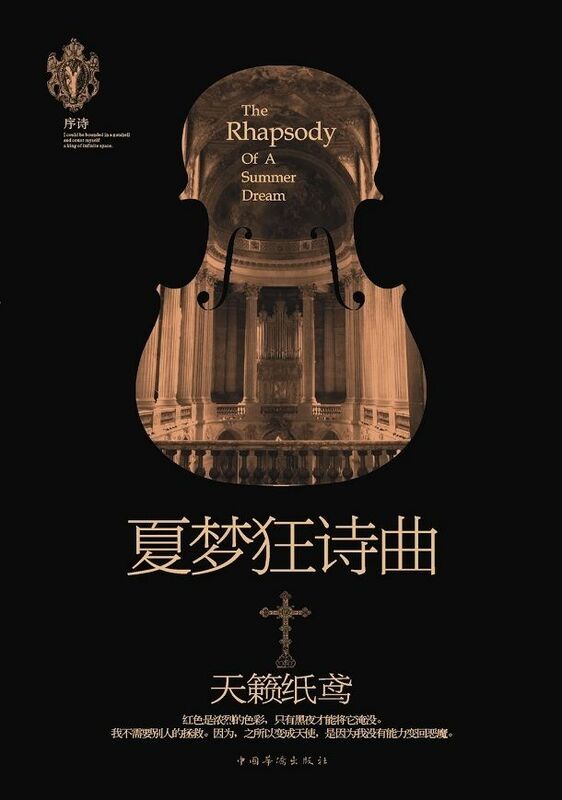 Synopsis of the novel follows violinist genius (Song Yi) who lost both of her parents at a young age and lives to seek revenge. For the longest time, music was her life and she started out following the footsteps of her dad. But now, every time she closes her eyes, she remembers the pool of blood forming around his head, and only wants to wear black while performing. After a betrayal that costs her a limb, she disappears and reappears five years later under a new identity, armed with a talented violinist under her teaching. She begins her revenge plan by getting close to an old friend (Zhu Yi Long), second son of a large corporation, who has a talent in numbers and stock market. It looks like his family adopted her when she was younger and some jealousy emerged among the kids. I only skimmed through the novel so am still not sure about the latter details. This entry was posted in Entertainment News and tagged Cdrama, Novel Adaptations, Song Yi, The Rhapsody Of A Summer Dream, Zhu Yi Long by Kappy. Bookmark the permalink. Zhu Yi Long is one of my main biases so I am super, super excited for this. Plus Song Yi has proven herself as a capable actress from the two productions that I’ve seen her in so YAY FOR HER! Time to pick up the novel and see if it’s my kind of thing. My friend is reading it too (no thanks to me but the book cover is really pretty!, Lol) and so far, nothing much in the first 2 chapters. But looks like things are getting juicier now that flashbacks reveal she has somethingsomething with the elder bro of the lead guy too. HA! They studied in London together during their teenage years, and he’s engaged with another lady, also a famous violinist, who has slapped our heroine twice in the past for their crossed line both in love and in work. So pumped for Yi Yi! Six pages in and I’m sort of hooked. My only gripe is that ZLY’s character is another poker face. But the good thing about his acting is that he uses his eyes a lot so he’s not entirely expressionless. Hehe. Zhu Yi Long!!! OMG. Where has this guy been these past few years that he is only just appearing now?!?! He is sooo handsome and I can’t wait for to see him as Fu Hong Xue and in the drama with Ady An… At this rate, any dramas/movies of his, I will probably (most likely) watch!!! I think I totally forgot about this, but what drama with Ady An? Gwaaahh!!!! I just went to look at the stills again (IDK how many times I’ve snuck a look!!! LOL). Any news on when it’s gonna air? The plot sounds like one with a bad ending but Song Yi!!! Miss this girl! She was so pretty and unforgettable on The Disguiser~ Looking forward to this! and Song Yi! she really impressed me in Disguiser. I mean, she’s definitely not perfect, and her acting could be a little raw in some scenes, but over all she definitely did well and held her own amongst the star-studded cast and veterans. And thank god they’re taking the music aspect seriously. I’m a cellist, and I cringe SO HARD when dramas or movies have their actors play string instruments without any sort of experience or knowledge. It’s easier to fake piano playing, but for string instruments…no. I get that they obviously can’t learn an instrument and get good in a short period, but having basic lessons at LEAST allows actors and actresses to mime with the correct posture and hand positioning! Even if the bow doesn’t move quite in tune with the music, doesn’t matter, at least have them holding the instrument in the correct way. Nothing irritates me more. Especially when they’re supposed to be super talented. That’s why it’s good that shows like Big Bang Theory (let’s ignore the plot for now) actually has a physics professor as their script consultant to make sure their physics jokes and other tidbits are accurate. BTW it’s really cool that you play the cello! 🙂 What a beautiful sounding instrument. What style of music do you play (you know how like in piano training they have jazz, classical, etc.)? Haha thanks! I mean, I don’t really differentiate. I’ve played jazz before, but like most, my teacher generally had me play anything from baroque to impressionistic and the stuff in between. Actually Joe Chen QiaoEn in Cruel Romance managed to mess up piano playing image quite badly. She is the only person I’ve ever seen performing on the piano in public wearing gloves. Even when pianists get cold fingers in the winter or even just practicing, almost no one ever wears gloves. I suppose every now and then, one could be possessed by fox demon or something and might wear them. 🙂 Some people said that TV producers used female hands to substitute for Hawick Lau in Lady and the Liar. It is kind of weird how there is a formula in many MinGuo series. Most lead actors/actresses have to play the piano and attend church regularly. while living in Shanghai. Some people complain that they put guzheng backwards in Fan Bingbing’s TV Empress Wu series. I didn’t try to analyze the sound vs the strings & fingers. Can’t stand that series. Quit long before reaching a guzheng scene. On a really shallow note, they’re going to be one stunning couple. Seriously. Lol I can’t help it; last comment. But anyways, just, why is it always the SECOND son as male lead? Can’t the first sons get the girls too? Not only do they not get the girls, they’re usually so horrible or something that they end up not getting the company either, and the company goes to the second son…again. I’ll be checking this out if subbed.